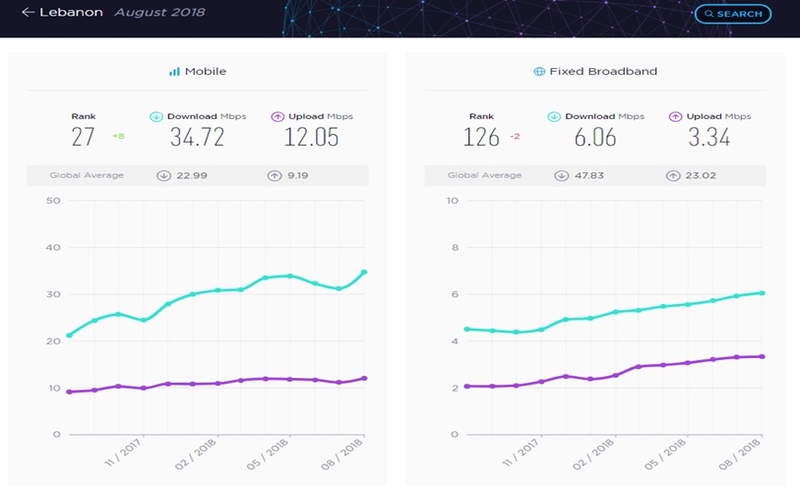 Lebanon, Egypt, and Oman all made gains for mobile internet speeds in August 2018, according to Ookla’s Global Index, which ranks mobile and fixed broadband speeds around the world. Yet, it is interesting that many of the Arab countries have improved mobile internet speed, but they rank lower in fixed broadband as Lebanon, Egypt and Algeria are towards the bottom of the list. Lebanon had jumped 8 rankings from 35th to 27th place in August, with the mobile internet speed increasing from 31.23 Mbps in July 2018 to 34.72 Mbps in August 2018. Oman advanced 8 rankings to take 42nd place, going from 26.8 Mbps to 29.43 Mbps. Egypt in turn, now ranked 77, moved up 7 rankings for improving its mobile internet speed from 16.26 Mbps in July to 17.47 Mbps in August. Qatar and UAE lead the August table for fixed broadband in the Arab Region, but they registered a lower ranking globally, as shown in the table below. Similarly, Lebanon made strides in mobile speed, but has a low ranking for fixed broadband, coming in the 126th place. Moreover, Egypt and Algeria rank last in the world in fixed broadband speed. Iraq is the country that recorded the largest decline in the ranking (-8 places) between July (15.17 Mbps) and August (13.24 Mbps). The internet disruptions and shutdowns during official exams in Iraq could be one reason. The progress in fixed broadband speed were few and far between as Jordan, Oman, Saudi Arabia and Morocco were the only countries in the region to move higher in the rankings.